Rent-All & Sales, Inc. is owned by Steve H. Mitchell since 1985. Steve graduated with a Masters in Construction Engineering from the University of Michigan and has over 40 years of experience in commercial construction. Three key staff, Robert, Sam and Tom, have over 58 combined years of experience at Rent-All & Sales, Inc.. 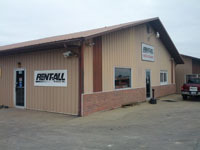 Located in Marion IL on New 13 next to the Williamson County Airport, we are easy to get to and have everything to fit your equipment rental needs. Please start browsing our online catalog to find the equipment you need or just give us a call - We look forward to meeting all of your equipment sales & rentals needs in Marion IL and Southern Illinois!